The difficulty which Morse encountered with his underground wire remained an important problem. Different circuits which conduct a steady electric current equally well are not necessarily equally suited to electrical communication. If one sends dots and dashes too fast over an underground or undersea circuit, they are run together at the receiving end. As indicated in Figure II-1, when we send a short burst of current which turns abruptly on and off, we receive at the far end of the circuit a longer, smoothed-out rise and fall of current. This longer flow of current may overlap the current of another symbol sent, for instance, as an absence of current. 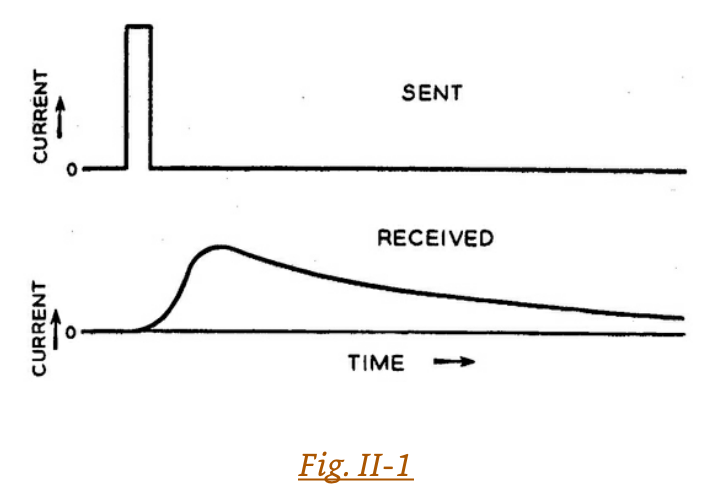 Thus, as shown in Figure II-2, when a clear and distinct signal is transmitted it may be received as a vaguely wandering rise and fall of current which is difficult to interpret. Of course, if we make our dots, spaces, and dashes long enough, the current at the far end will follow the current at the sending end better, but this slows the rate of transmission. It is clear that there is somehow associated with a given transmission circuit a limiting speed of transmission for dots and spaces. For submarine cables this speed is so slow as to trouble telegraphers; for wires on poles it is so fast as not to bother telegraphers. 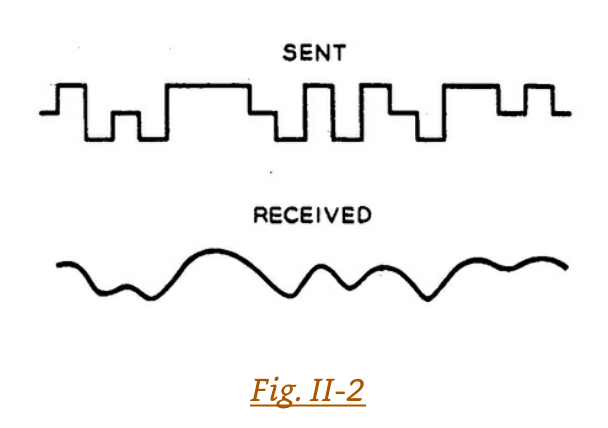 Early telegraphists were aware of this limitation, and it, too, lies at the heart of communication theory. As someone who does not have an electrical engineering background, I find the described phenomenon perplexing. If one sends short bursts of electric current that abruptly turn on and off, why is it true that, depending on the type of circuit, the receiver may receive a smoothed-out current, rather than the discrete currents that were sent? One would expect, naively perhaps, that the signals received would be identical to the signals sent? I would greatly appreciate it if people could please take the time to answer this using language that can be understood by someone without an electrical engineering background. Your cable behaves like a low pass filter, which means that high frequencies are getting damped. The longer the cable, the stronger is this effect. Impulses have, due to their fast rise and fall, pretty fast frequency components. If these high frequencies are damped, your impulse "smears" over time and you get the desired result you posted in your question. Perhaps it would be useful to think of it differently. Instead of shoving electricity around, pretend that you have a very long pipe, some water (at pressure) and a valve. If you turn on the valve at one end of the pipe, it will take a certain amount of time to pressurize the pipe and force the water through. At the other end, the water will eventually come out, but as a slow increase in flow, followed by a slow decrease. If you turn the water on and off quickly enough, it will simply appear at the other and as a moderate flow. As mentioned elsewhere, in electrical terms, this is due to the capacitance, and inductance of the long cable. The longer the cable/pipe, the greater the apparent smoothing effect. The reasons (physics) and math may be different, but the results rhyme, and hopefully that will help you understand. Infinitely sharp edges in the signal need infinite bandwidth to transmit which is not possible with real world wires. Taken a long enough wire, it passes only low frequencies and high frequencies are attenuated, so the sharp fast edges get smeared into slower wavy edges and thus you need to send longer pulses to see the voltage to slowly rise up to proper detection level at the receiving end. The signals degrade as each unit length of the copper wire can be thought as a series resistance with inductance and it also has stray parallel capacitance and leakage resistance to its surroundings, otherwise this model is known as a transmission line. The series resistance with parallel capacitance is a low-pass filter. The capacitance and inductance forms what is known as the characteristic impedance of the transmission line, and if the transmitting and receiving ends do not match the transmission line impedance, a voltage pulse will reflect back to wire to some extent so it ping-pongs back and forth in the wire until it settles. As the voltage pulse travels in the wire at roughly two thirds of the speed of light, all this how much the signal degrades when it travels through the transmission line or keeps bouncing between the ends of transmission line determines how fast signals you can transmit and how far you can transmit them without being too degraded. Not the answer you're looking for? Browse other questions tagged current signal or ask your own question. How does audio get transmitted from my iPod to speakers? Is it possible to receive information if the received power is below the noise floor? Why does one stepper motor consume a fixed amount of current, and the other is variable?